I don't want to tempt fate (wot me? Superstitious? Never!) but I think my hair is less oily than yesterday. It still looks like it needs a wash, but... just maybe... it might have turned the corner. It turns out that saving tomato seeds is not simply a matter of taking the seeds out of the tomato and spreading them out to dry. The issue is the protective jelly that surrounds each seed. In the wild, tomatoes fall to the ground, rot, and the seeds are left free of jelly and ready to germinate. With the jelly in place, there's no germination. I'm planning on buying tomato seeds anyway this year, but I had a recipe that involves scooping out the seeds and middle bits from cherry tomatoes. I say recipe... I saw cherry tomatoes stuffed with cheese in Waitrose and thought, "They look nice." I did it for a party. It was a fiddle, but they were indeed nice, and I had all the seeds and pulp left over. Shame to waste them, so I put them in a pot with some water, as per instructions, and left them on the side in the kitchen. Tomato seeds. In pot. With water. Then I waited for the mould to appear. They smelled bad - not excruciatingly bad, but fairly unpleasant - and a few bubbles were spotted, but no mould. Today, finally after two weeks, the first sign of something that might be mould on the surface. I have never been so happy to see something going mouldy in the kitchen! Now, looking back at the instructions, I see that I should have only given it three days (in a warm place. I don't have a warm place) and I should have waited for mould or bubbles. Oops, I had bubbles. Time to rescue the seeds, I think! Either I'll dry them for planting in a month or so, or if they're germinating I'll have to plant them straight away. Then I'll just have to find somewhere warm for them until the weather picks up. I learnt to knit when I was about ten, and a few of my school friends did too. One day, my mum offered to help me, but was bemused by the way I was doing it - putting the needle into the back of the stitch instead of the front. She told me that would result in twisted stitches and I should change it. I found it difficult to change, got frustrated and cross, and resolved to keep doing it my way, without her help. The school craze for knitting didn't last long, and although I always intended to come back to it someday, I was left with the feeling that I was doing it wrong and would have to unlearn what I knew then start again from scratch if I was ever to knit the way Mum did, i.e. fast. Recently I decided that the time had come to get over that barrier and learn to knit again. During the house move I'd uncovered a lot of old children's books, including the Usborne guide to knitting, which seemed like a good place to start teaching myself the basics. I opened the book and, clear as anything, the picture showed the needle going into the back of the stitch. I was vindicated! My sister is due to have her first baby this spring and baby clothes, being small, seemed a good project to start on. When I suggested this idea to her, she made it clear that hand-knitted clothes made by an aunt who's just learning to knit were not quite what she had in mind for her baby. She did suggest a blanket made of knitted squares, which I have to admit is much more sensible. That's the trouble with my sister - she's bossy, but she's always right! Don't ask how I came by that ball of pink wool - it was just in a drawer, OK? I decided to try different stitches for the different squares, and started with the most basic, garter stitch, knitted MY way. It came out fine, and I moved onto stocking stitch; alternating rows of the two basic knitting stitches, knit and purl. I found that following a row of purl, it's the front, not the back, of the stitch that presents itself most naturally to the needle, so I switched to putting the needle into the front of the stitch. Easy. It really isn't the big deal it was when I was ten. I'd heard a long time ago that if you leave your hair alone for long enough it will revert to a natural state of looking after itself with no need for shampoo. The theory is that shampoo strips the natural oils from hair, so the scalp compensates by producing more oils than it would otherwise, so you have to shampoo them out, and so on... This makes sense to me - after all, my cat has a lovely soft coat without using any shampoo and I'm sure all that 'washing' she does is really just combing. No shampoo here, and just look at how fluffy that tummy is! The idea of not having to wash my hair has always appealed to me and if I don't use shampoo that's one more thing (two counting the conditioner) that I don't need to buy. A little research revealed that yes, people do this - it's not just an urban myth. A Daily Mail article was particularly interesting (yes, really!) They asked five women to stop washing their hair for six weeks. Three of them found the experience a revelation - their hair looked and felt much better and they saved a lot of time and money. The other two were utterly miserable - their hair just got greasy and horrible. So, it doesn't work for everyone, which was news to me, but I noticed that the three who got on well with it were brunettes whilst the two who didn't were blonde. It's far too small a sample to generalise, but I found this encouraging nonetheless. I found a blog entry that gave guidelines on how to manage the transition from daily washing to not washing. Step one: reduce washing frequency - well I washed every other day to start with, so that didn't really apply to me. Step two: switch from normal detergent-based shampoo to soap-based shampoo. Now, my friend Amanda at Realize Beauty has explained at great length why soap is not good for washing hair, but I tried it anyway. Amanda was right: Soap left icky gunk in my hair. Step three: switch to baking soda in water followed by a vinegar rinse. Well, I'd tried baking soda once before and found it really harsh on my hair, so I wasn't too keen to try that again. Step four: finally, stop washing hair altogether. Hmm, I seem to have rejected all the interim steps, so I'll just have to go straight to not washing and put up with the yucky transition period. I wasn't sure whether not washing meant not even wetting the hair or continuing to rinse regularly with water. I did once try water-only washing, or at least just a herbal rinse, and that was horrid. It left my hair wet AND greasy. Also, I can't really see how water alone's going to tackle oily hair - washing oil off hands with just water doesn't work, so why would I expect it to for hair? Therefore, my no-washing experiment will involve going straight from washing with ordinary shampoo (and quite harsh shampoo at that, because we bought a cheap brand) to not washing, or even wetting, at all. This is not going to be pretty. Following the Daily Mail article, as well as what I heard years ago, I'm going to give it six weeks. If I'm not happy with my hair at the end of that I'll go back to washing it, as infrequently as I can get away with. I'm almost two weeks into the experiment now, and no, it isn't pretty. Having said that, it seemed to stabilise after about five days and hasn't been getting any greasier since then, so I think my scalp must have already reduced its oil production. The trouble is, my hair is still full of oil. I know that lots of brushing is an important part of this not-washing business (just look at the cat) and natural bristle brushes are recommended. I'm not sure how seriously to take this recommendation, as it tends to be wrapped up in a "Natural = good, Synthetic = bad" philosophy, which I find rather simplistic. Some people say natural bristles are less likely to break the hair than plastic ones, which I can't believe because you only have to look at the brushes to see that the bristles are similar hardness. I also find natural bristles rather scratchy on my scalp whereas the bobbles on the end of the plastic bristles massage quite pleasantly. On the other hand, natural bristles are more tightly packed in the brush, so I can see they're probably better at carrying the oils down the length of the hair, but then a comb has the same feature. What it really comes down to is the fact that I already own a plastic brush and I don't have a natural one. I'll stick with what I've got, but use a comb as well. At this stage, Ian and I are both getting pretty fed up with my unwashed hair (though he's being supportive - he might even try it himself if it works for me). 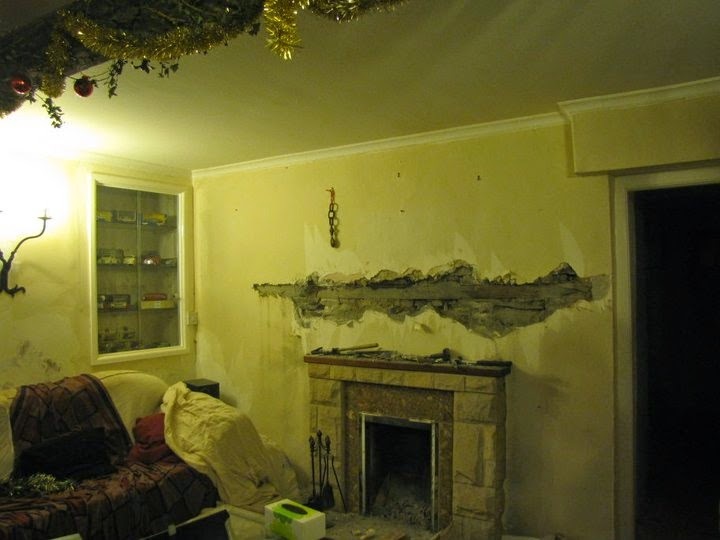 It doesn't look too bad, it just doesn't look particularly nice either. This morning I started wondering about the dry shampoos I've heard about - essentially they just absorb the oil and you brush them out. I tried brushing through a little bicarb - only about a teaspoonful - and I think it reduced the oiliness a little, but I'm not entirely convinced. My hair still feels sticky and I'm getting obsessed with brushing and combing it. Sitting here writing a blog entry isn't helping the obsession, either! I've also found that some people take this very seriously indeed. I do not intend to care that much about my hair! I'll stick with it for six weeks because really, it's not all that long. At two weeks, though, I'm not enjoying this very much. 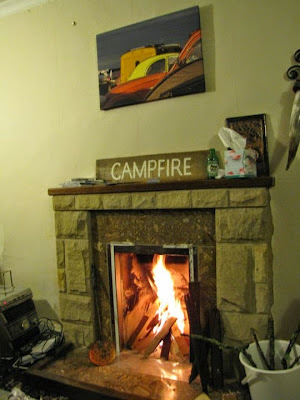 Our heating project included grand plans for a woodstore. With a south-facing gable end, that was the obvious place to put the solar panels, but not flat to the wall. They'll be more efficient if they're propped out from the wall on a porch roof type arrangement (I've since discovered that this is quite normal, and known as an A frame). If we're having a porch roof against that wall, what better place to store wood than underneath it? Therefore, we'd build a nice, strong, well-supported roof and store wood underneath it. The trouble with this plan is that it's quite a big project, and I'm not really sure how to do it. In the meantime, we need somewhere to store wood. Focus has wood stores on sale for £70, which is probably as much as we'd spend on wood and bits if we started from scratch. We gave in and bought it. I should say I gave in. I'm not sure Ian was that keen on the Grand Project in the first place - it was him who suggested the Focus one. This morning, on my way back from the compost heap, I noticed little knobs of green in the earth as the bluebells push their way into the sunlight. Looking around at the only bed I've planted anything in, I saw a whole row of young plants - green shoots about four inches tall that I hadn't noticed before because I just hadn't looked. We have garlic! Of course it's only January and, as Ian said this morning, "Winter's probably going to come back and bite us on the bum," but today the weather is mild and the first things I planted are growing strongly. Today feels like spring. The eagle-eyed amongst you (I'm writing this as if I have readers! Haha!) will have noticed that when I finished making marmalade I had only used two thirds of the fruit. The remaining third was still sitting in water in the wine-making bucket. Now there's an idea! Hmm, what could I possibly do with all this fruit that happens to be sitting in the wine-making bucket? The wines I'd tried so far both included lemons as a dominant flavour, so why not go the whole hog and try a citrus wine? Well, it would be better than leaving the fruit to go mouldy, anyway. So, I topped up the water in the bucket, added a bag of sugar (much less sugar needed for wine than jam) and a teaspoonful of yeast, and left it for a few days in the airing cupboard. That yeast really is getting old - it should start bubbling in about 24 hours, but this took three days. I must get some more - maybe I'll even get some wine yeast. In the midst of winter, when Christmas is over and spring is still a long way off, when we know the days are getting longer but can't really see it yet, at this lowest point of the year, Seville oranges are in season. This might not seem like much to get excited about, as these oranges are bitter and not very tasty, but make marmalade out of them and they bring sunshine into the kitchen. I've made small quantities of marmalade (and other jams) from time to time over the years in a saucepan or two, but this year I decided it's time to invest in a proper jamming kettle. After all, I'll be doing quite a lot of this sort of thing. So it was that I headed off to Charlie's in Aberystwyth - a shop that has almost no shop front at all but all kinds of wonders inside - and purchased a shiny new jamming kettle. I bought the stainless steel one, which cost twice as much as the aluminium one, but I reckon if I'm buying equipment that I expect to last a lifetime, I should really get the best. The next day, I headed off to the greengrocer's, where I overheard a lady say that she'd caught the first scent of spring in the air that morning. A bit early, I thought, but cheering nonetheless. I hadn't done much by way of calculations, but thought four or five pounds of oranges would be a goodly quantity. Grandma's recipe, which I always use, starts, "Allow one tangerine and one lemon to each pound of Seville oranges," so I duly bought six lemons (one for general cooking) and about ten satsumas (five plus some for eating. These are near enough to tangerines, I think). Next step was chopping the fruit, which I set to work on that evening. I have a serrated knife which I use for this purpose and tomato salads in the summer, and not much else. It stays pretty sharp. I had almost five pounds of oranges, plus just over three pounds of the other fruit. Eight pounds of citrus fruit is a lot. I chopped away for a good two hours, maybe more, and although I got a stiff neck (really should have sat down to this job, but Ian was using the table), the kitchen smelled wonderful, so I quite enjoyed the task. By the time I'd finished, the kettle was more than half full. Next, consult recipe: "For each pound of fruit add three pints of water and leave to soak overnight." Hang on, for eight pounds of fruit that's 24 PINTS of water! The kettle, which has a helpful scale up the side, takes 15 pints. Hmmm. I added nine pints (the fruit already being six, apparently) and left it overnight, to ponder the question further in the morning. Clearly, I wasn't going to get all of the marmalade into the jamming kettle to cook. The point of buying the kettle was not to need to make jam in batches any more. Oh well. I ladelled out half of the mixture into the big mixing bowl and added water to what was left in the kettle (much calculating required here). I now had fruit and water in the right proportions, but the kettle was still too full, as I still had to add sugar and it would rise up as it boiled. OK, needed another big container. I cast around the kitchen and lighted on the wine-making bucket. I ladelled more mixture out of the kettle into that, leaving five pints in the kettle, then put that on the hob to boil. This took quite a long time. Golden citrus fruit in a shiny new pan. What could be nicer? No, really, that has to be too much sugar. I looked at a more modern recipe, which called for 2 lb sugar to each pound of oranges, plus lemon juice (not whole lemons). Much less sugar. Many calculations later, and I'm not at all sure how I arrived at this, I decided on 5 lb sugar for my 5 pints fruit-and-water (one third of the total quantity of fruit). Boiling the first batch took a lot longer than the recipe said, and that was long enough. In fact, it took most of the day. I probably could have turned the heat up to spead it along a bit, but I was in the kitchen anyway, baking for a party the next day, so I didn't mind just leaving it. I did notice rather a lot of condensation on the kitchen windows by the end of the day, though. I had clean jam jars in the oven, sterilising nicely, and eventually dripped a bit of the mixture on a chilled plate and decided that it was looking distinctly marmalady when it cooled, so ladelled it into the jars. Eight jars (of various sizes) and this was only the first batch! I got straight on with the second batch, after some complicated pouring of mixture from one container to another to get the right amount of water and the right amount of fruit. With the heat a bit higher it cooked faster this time, and I was still baking anyway. I had to use some smaller jars for the second batch and ended up with eleven, so nineteen jars of marmalade so far, plus a ramekin dish, plus a small saucer, because I hadn't heated enough jars. This is a lot of marmalade, especially as Ian doesn't like it. Can I get through nineteen jars in a year? Probably not. Some relatives may be getting home-made marmalade for Christmas next year - sorry folks. Alternatively I could call it two years' supply, but that would mean missing out on the kitchen-based sunshine that is marmalade making next January. I don't think so. Note for future reference: 'four or five pounds' of Seville oranges is too much. It's delicious, by the way, with the reduced sugar content. There's really no need for that much sugar, but then Grandma always did have a sweet tooth. One sunny day - an opportunity not to be missed! I've been feeling daunted by the garden since we got here. If I think about digging and planting the whole lot, which is the task ahead of me, it seems like a massive task. Worse, I keep thinking of extra things like, 'replace that leylandii hedge with native species' which in itself is about three weeks' work. What I needed was a managable task that would get me started, and soon. The garden's divided into raised beds, the smaller of which could be easily dug over in an afternoon, but the one nearest the house is huge. It was this one I set my sights on - I reckoned I could dig the weeds out of half of it in a day. I took a line from the sprawling rose by the wall to the plant-which-might-be-comfrey by the path and set to work digging everything on the house side of that line. The soild in our garden is lovely - rich, dark and friable. It's very easy to dig. So easy, that as I started I got a bit carried away and thought I might get the whole bed done in the day, but that was when I had only shallow-rooted weeds. As I got to the deeper ones I slowed down a bit. Still, I kept going, alternating digging with ferrying weeds up to the compost heap. Robins started taking an interest, though the first one to turn up quickly got chased off by the second. This presented a dilemma - worms are good for the garden, so I don't want the robins to eat them, but who could chase away a cute little robin that sits and watches you dig? About two-thirds of the way through I took a break for lunch, then went back to it and indeed, got the half-bed finished as the last of the sunlight disappeared from the mountains. So there we are. I set myself an acheivable task, and acheived it. Having got started on the challenge that is The Garden, it feels less daunting now, even though I haven't yet figured out what's going where. I think I'll put potatoes in the big bed, though I haven't yet worked out whether half the bed will be enough or whether I'll need the whole bed. Next, I have to investigate the free horse manure I've seen advertised in the next village (fresh or rotted is the key question) and find a decent source of seed potatoes. 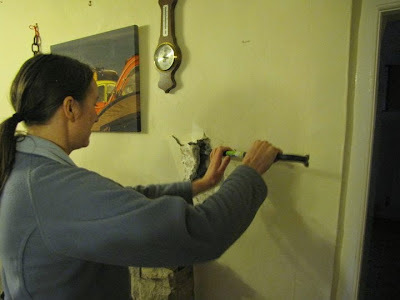 What better way to see in the new year than by taking a hammer, chisel and crowbar to the sitting room wall? Here's the sitting room fireplace as it was when we bought the house. After a couple of hours of happy destruction, we have a lintel! Yes, it's big! I was going to expose it all, but gave up before I got to the left hand end. It probably goes all the way to the wall, and I don't think we want a firelace that big. The next step is to find/choose the edges of the old fireplace then remove all the brickwork etc that's filling the gap. 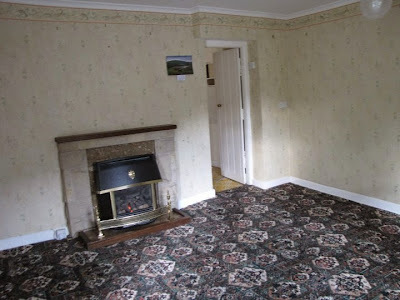 This will have to wait until we're pretty much ready to fit the stove, as once we've done it we'll have a very large gaping hole in the sitting room wall. The tricky thing is knowing what size register plate to get to go across the chimney before we've opened up the space to find out how big the chimney is. I foresee a rather chilly few days in the middle of that job.